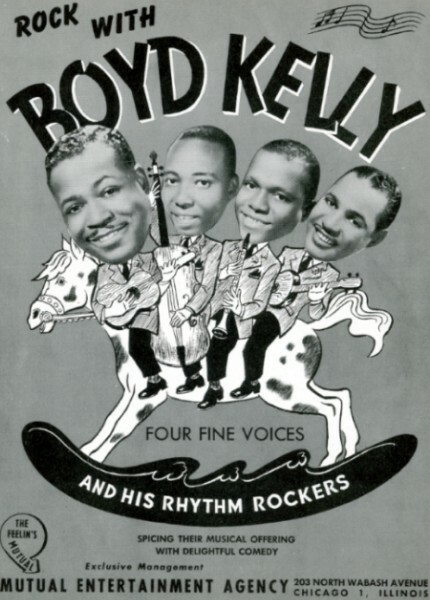 Above: Promotional clipping of Boyd Kelly And His Rhythm Rockers from mid-1940's. Does anyone know if this vocal/instrumental grouping ever had any released records? Boyd was with Sweet Dixon in 1937... wonder if Dixon was in The Rhythm Rockers? Does anyone know the members' names? Above: Label for Decca 7294 recorded on March 17, 1937. 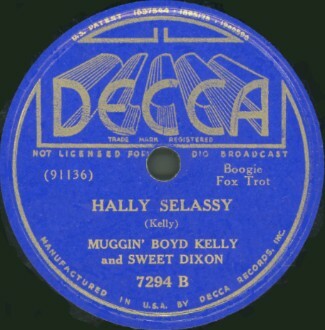 Muggin' Boyd Kelly And Sweet Dixon had two recording sessions in 1937 resulting in three releases on Decca's R&B 7000 series. Louis Armstrong's version of the flip, "Marie", was released on Decca three years later, backed by The Mills Brothers. A) Click on an option below to listen to Muggin' Boyd Kelly And Sweet Dixon using Streaming RealAudio. B) Click on an option below to listen to Muggin' Boyd Kelly And Sweet Dixon using Downloading RealAudio.